My Munchable Musings: Produce of the Week: Horseradish! Produce of the Week: Horseradish! Yes, it is ugly. But it's good for you! This is the only time of year I think about horseradish. Such a "bitter herb" doesn't usually make it into my sweet-tooth-influenced culinary adventures. But, it is the first night of Passover tonight, and I am necessarily obliged to think about the root. Apparently, most people think that horseradish is only fit to be used in sauces and cremes. Or, if not, their family came out of Eastern Europe originally and still finds comfort in boiled cabbage and brisket. Well, once committed to using horseradish, I couldn't very well give it up! Horseradish happens to fall into our favorite family of vegetables - the brassicas - hence its distinctive cabbage-y, turnip-y flavor. While it has graced the fields of people dating back a few thousands of years, it was used mostly for medicinal purposes. It boasts a slew of vitamins and minerals, in addition to diuretic and antibacterial properties; it was commonly used to treat ailments such as sinus congestion, coughs, and urinary tract infections. In terms of food origins, the Germans are granted responsibility for using horseradish as a condiment on meat and fish. And while I definitely found horseradish recipes while scouring my family's collection of cookbooks, I don't have too much interest in the many way the root complements gefilte fish! So, I gave up on Jewish cooking and my E. European roots, I decided to embrace some newer takes on the old standby. The LA Times had an appetizing Beet and Horseradish side dish recipe - however, I found it a bit too heavy on the mustard. Playing off of my favorite winter staple, check out this Roasted Root Veggies recipe with our bitter star. For a bit of eccentricity, try the Parsnip and Pear Latkes and substitute 1 tbs grated fresh horseradish and 1 tbs tapioca starch for the egg. If you really want to make that transition to spring, opt for a light Asparagus dish with horseradish sauce. 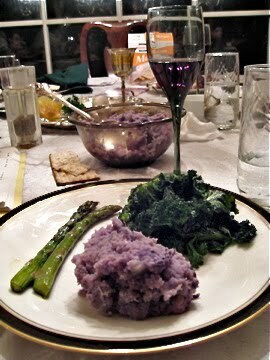 For me, tonight, I added a little zip to my mashed potatoes and kale inspired by 101 Cookbooks! 1. Boil potatoes and rutabaga until fork tender. 2. While potatoes are on, caramelize the onions in a small frying pan with about 1/2 tbs olive oil. 3. When both are done, combine in a bowl (or sauce pan) with horseradish and salt. Mash with a masher! 4. Add olive oil to preferred taste and consistency. 5. Serve with a side of garlicky sauteed kale!